As many of you know, I teach middle school language arts in a Catholic school located in an affluent suburb of Washington, DC. Yes, I spend all day with pre-teens and teens, awash in adolescent hormones, Axe body spray, egg-shaped lip gloss containers, and poor grammar brought on by texting and IM’ing. Six periods a day, a surfeit of shuffling Sperry-wearing seventh and eighth graders file in and out of my classroom for forty minutes of literature, vocabulary, writing, grammar, and a fair dose of my unbridled enthusiasm for reading. I love teaching language arts; that is, I love everything that happens “inside the bells”. I love the energy of the kids as they come in and settle in to their desks. I love telling them about my favorite books and my favorite authors. I love teaching vocabulary and unlocking the vagaries of the semi-colon. I love connecting the literature we read to major world events and historical eras. I particularly love the Victorian era, complete with its formality, rigid social class system, and of course, great pieces of literature like The Hound of the Baskervilles and The Importance of Being Earnest, both of which I teach to 8th grade. After the final bell of the day rings, however, well, let’s just say that the next three or four hours are not exactly what keeps me in this grossly underpaid and overworked occupation. As much as I love teaching English and literature, the expectation is that the students demonstrate their new-found knowledge of literary devices, story triangles, figures of speech, and the like, in a never-ending stream of assessments such as compare/contrast essays, tests and quizzes, personal narratives and research papers. These things take forever to grade. My husband (not a teacher) keeps telling me to make my assessments more objective so they will be easier and faster to grade, but in order to prepare them for high school they must learn how to write a decent essay and that can’t be accomplished with multiple choice or true/false questions. As dismal as this nightly ritual of endless grading may seem, there are other things “outside of the bells” that I dislike much more. Je déteste le recess duty! Recess duty (one day every other week…I know, quit complaining) consists of standing outside, swatting gnats or freezing, walking up and down an asphalt driveway overlooking the school’s artificial turf soccer field, while watching 140 middle school students for thirty excruciatingly painful minutes. 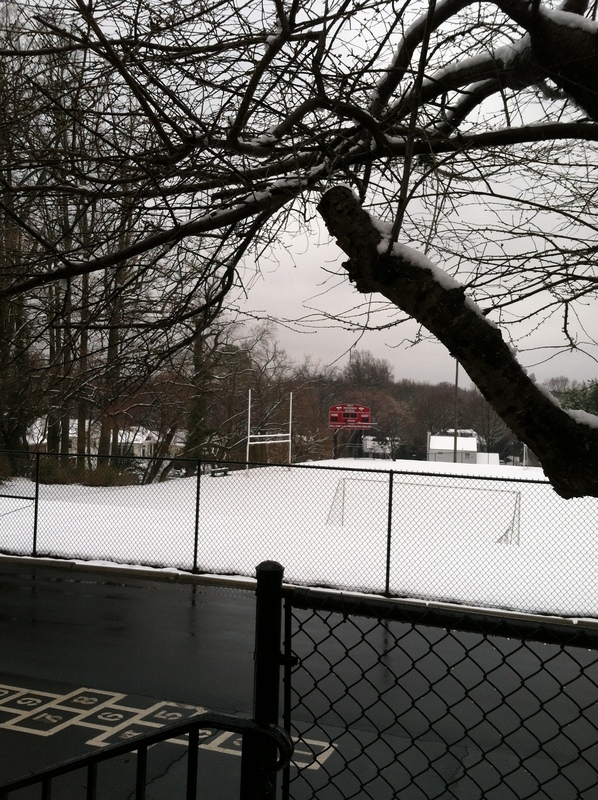 Our turf field in the dead of winter, a carpet of white velvet…no outdoor recess this day! Winter months, especially the winter we just experienced here on the East Coast, brings respite in the form of “indoor recess”, with the field barren and empty, often blanketed in a carpet of white velvety snow. When the weather is good, however, out we go. Occasionally I will strike up a conversation with a group of sixth grade girls who are sitting on the school steps, but it is really their time away from teachers and school work, so eventually I move on. If there was a bench, I could tolerate it. If there was a bench and a book, I would be ecstatic. If there was a bench and a book and a cup of tea, well, I would be in heaven. But, alas, no bench, so instead I walk the driveway and survey the soccer field littered with various balls, nets, and dozens of pairs of Sperry slip-ons, kicked off to make running and kicking easier. Some days I focus on one particular group and watch them play. A few years ago, a group of 8th grade boys regularly gathered to play touch football, and one bright and sunny spring day I watched them intently for about fifteen minutes. I knew those boys well, having taught them for two years. Half of them were in my home room, the other half just two doors down in the science room for home room. As with any class, some of them were good students with the academic skills to do well, some were decent students who worked incredibly hard, and some were students who struggled daily with reading comprehension, writing, grammar, and of course, with maintaining any sort of interest level in the literature they were assigned to read. Of the latter group, on that bright and sunny spring day, I watched one particular 8th grade boy catch the football and run like the wind the entire length of the field. He ran with long easy strides, perfect posture, ball tucked securely in the crook of his left arm, head tilted back, in a style reminiscent of “the flying Scotsman” Eric Liddell, born in China to missionary parents from Edinburgh, Scotland, who was brought to fame via the Oscar-winning movie Chariots of Fire. With his unorthodox running style, Liddell captured Olympic gold for the track team of Great Britain at the 1924 games in Paris. He did it in his own way, however, refusing to run in a heat for his “favored distance”, the 100 metre, which was to be held on a Sunday, being the Lord’s day of rest. So, instead, he ran the 400 metres, which had never been his best race. The qualifying heats for the 400 metres were held on Thursday and Friday, and while not the fastest he qualified. In the final event, with the crowd cheering him on, however, he threw back his head, lowered his arms, and finished the race in first place. In his school uniform of navy Bermuda shorts and a navy sweatshirt, his white athletic crew socks sharply contrasted against the bright green artificial turf, my student was the very epitome of grace in action, relaxed and happy. No one could catch him, in fact, after half a length of the field, they all but quit trying. When he reached the end, he turned in a semi-pirouette, and started back, running in the same graceful style, back to his group of friends he had left coolly behind. He was all smiles, very different from his gloomy look in my classroom. As I watched him, I realized I was envious of his obvious and natural athletic abilities. I never played a sport, other than a few miserable weeks one summer when my mother attempted to “make” me play softball. In high school I lifeguarded at the pool in my hometown, but that was more people-watching than sport. Sure, I jumped in to save the odd child, over-confident and under-skilled, slipping beneath the surface, head bobbing up and down, but I was a strong swimmer so it didn’t require much effort, and hardly a display of athleticism. Another summer, as an adult, I traded English lessons for tennis lessons with a wealthy Iranian exchange student whose family had fled when the Shah’s regime fell. The tennis was just a bit more successful than the softball, but neither was as enjoyable as watching Wimbledon or the French Open from the comfort of my living room. No, my natural talents are for letters and words, not rackets and balls. I love reading and writing, and I find vocabulary truly fascinating. The graceful athlete down on the field would rather be anywhere other than a language arts classroom. I wonder where he will end up as an adult. He is in high school now and I wonder if he is finding success as a high school athlete. Will he go on to play college sports? Will he figure out a way to be successful in the language arts classroom as well, so as to keep his grades up to stay on the team? Watching him run that day, I truly hope that he finds a way to work it all out. I hope he ends up with a career in sports, coaching or commentating. I hope he spends many, many hours running the length of a field, deftly weaving in and out of contact with the opposing team, his long, graceful strides the envy of all watching, especially his middle school English teacher. ← My Name is Michelle Ardillo and I am a . . . This essay is truly inspiring in its own way; it let’s you kind of peak in on the enjoyment and talent of someone entirely different than you and what you’re used to. Writing and vocabulary are the things that make you tick and keep you passionate yet simply observing someone else who finds the same type of passion in something entirely different, like sports, is a pleasant way to find another’s happiness. It just goes to show you that we’re all merely people trying to find our passions, what we’re best at and what keeps us the happiest, and finding a way in which we can continue doing them for a lifetime. This is a beautiful piece, thanks for sharing. This is a really lovely article. I hope he finds his success too, his place in the world so to speak. Not everyone is good at the same things but everyone has something they’re good at and passionate about. Another heartwarming article. Thanks, Michelle.